By 1962, the Godzilla franchise had been dormant for 7 years. Meanwhile, Toho had given the world Rodan and Mothra to great success. But reviving Godzilla wasn’t an immediate thought. Instead, it came about after a rather long series of events that began in 1960. Willis O’Brien, the stop-motion animator behind the original King Kong in 1933, had long wanted to do a new Kong flick. His idea involved a giant Frankenstein monster. He took his idea to RKO Pictures, who he believed owned the rights to King Kong. They initially liked the idea but were concerned about using Frankenstein’s monster since they believed Universal Pictures owned the rights, which they did not. Producer John Beck became involved and began morphing the story around but it soon became apparent that stop-motion would prove too costly. Beck approached Toho with the idea and Toho was interested as they had wanted to do a new version of King Kong. This coincided with their desire to revive the Godzilla franchise and, by 1962, the story had become King Kong vs. Godzilla. Sadly, Willis O’Brien never received credit for his initial storyline as the deal was done without his knowledge or consent. O’Brien would die in November 1962 at the age of 76. Toho forged ahead with King Kong vs. Godzilla with Ishiro Honda taking the director’s seat. 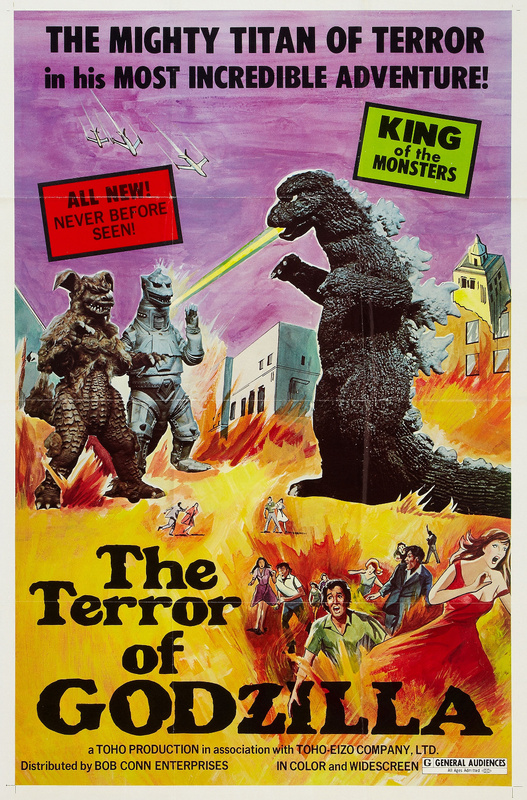 By 1962, Toho was producing all of their films in color so the big guy was to finally make his colorful debut. This would also mark King Kong’s return to the big screen for the first time since 1933. Sadly, the suit made for Kong is far less convincing than the stop motion version done almost 30 years earlier. Personally, while I have fond memories of this movie as it was my first Godzilla experience, King Kong looks rather cheaply made. The general thought is that not only it is it one of the worst-designed creatures Godzilla faced, it’s also one of the worst filmed ape creatures of all-time. Our story centers on a pharmaceutical company in need of boosting profits. Mr. Tako (Ichiro Arishima), an incredibly over-the top owner, is looking for a way to increase sales and sends two men to a mysterious island in search of a mythical giant beast. Meanwhile, we follow the exploits of an American submarine that crashes into the same iceberg that Godzilla has been frozen in since the end of Godzilla Raids Again. Godzilla returns with mass destruction on his mind, getting all the press, which infuriates Tako. Meanwhile, on the island, there is indeed a giant ape creature known as King Kong. In a truly fun sequence, a giant octopus emerges from the sea to terrorize the villagers, forcing Kong to arrive and defeat the sea creature. This scene was filmed with a real octopus as well as a brief animated sequence where the octopus grabs one of the villagers. Surprisingly, it holds up rather well, despite the poor Kong costume. Kong drinks a red juice the natives make and falls asleep, allowing the pharmaceutical company to capture him and bring him back to the mainland. Of course, it’s only a matter of time before Kong awakes and confronts Godzilla. Initially, Godzilla forces Kong to retreat. We are then treated to Kong recreating events from the original 1933. He attacks Tokyo, kidnaps our main female lead, Fumiko, and sits atop a building before succumbing to an attack of red juice, again knocking him unconscious. He is captured and transported to the top of Mt. Fuji, where Godzilla has taken refuge, in hopes of a main event confrontation. 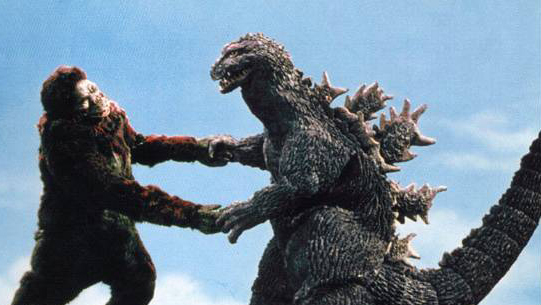 What follows is one of Godzilla’s more iconic battles, despite the poor Kong costume. Ultimately, both beasts fall into the ocean, where only Kong emerges. However, as we see Kong escape with a return to his island, we hear Godzilla’s roar, implying he was indeed alive to return another day. Well, at least we did in the Japanese version. Much like Gojira, the Japanese and US versions of King Kong vs. Godzilla have specific differences. Producer John Beck retained exclusive US distribution rights, which included his plans to re-edit the picture as he saw fit. Some scenes were cut while others were rearranged. Beck wanted the film to have a more American feel to it. Therefore, footage of a satellite and an American newscaster were inserted to describe the events of the movie as they unfolded. Earthquake footage from The Mysterians (1957) was also used to make the main fight sequence more destructive. But the most jarring change is the soundtrack. Akira Ifukube’s original score is mostly removed in favor of stock library music. Yes, that is the iconic Creature from the Black Lagoon music used at one point. It always brings me out of the moment. The original Japanese version fairs much better and should never have been changed. 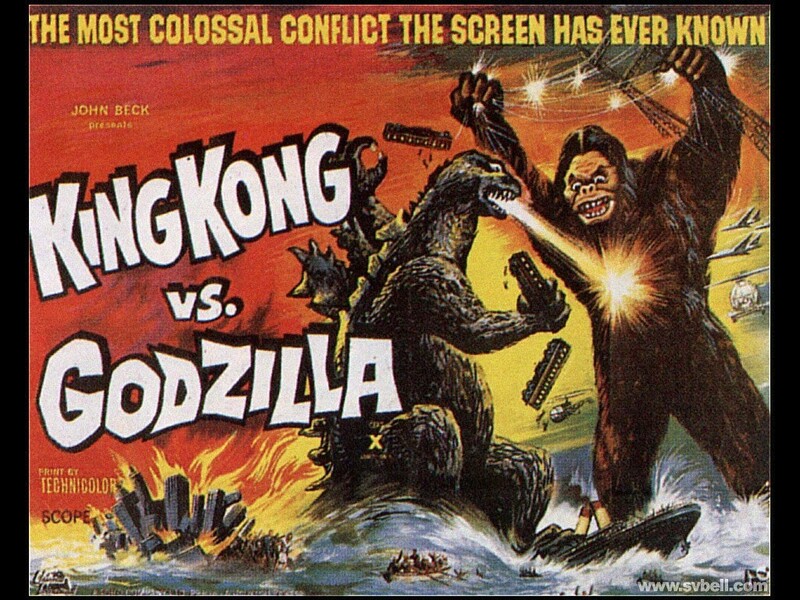 One myth that has been debated for years is that the American version allowed Kong to win while the Japanese version gave the victory to Godzilla. But no, this is not true. Having seen both versions, the film ends the same with one minor difference. Godzilla’s roar is not heard at the end of the American version. This is what has most likely caused some to speculate that Godzilla loses. This marked the first step into a more comical approach to Godzilla. Many on the production crew were displeased with how lighthearted the film was, believing that Godzilla was more appealing when he was something to be feared. However, Toho wanted to broaden the audience and felt targeting children with the more comical scenes was the way to go. And, as I’ve already covered in some of my previous reviews of the films of the 60s and 70s, this concept was not going to go away. Sadly, the Japanese version remains unreleased in the US. I actually prefer it over the American version but must admit, having watched the satellite and newscaster scenes since I first watched this on a Sunday afternoon in the early 1970s, it did feel like something was missing at first. But I really appreciated not thinking of the Black Lagoon during the main battle. The American version is easily found on DVD. Hopefully, someday we’ll get an official release of the Japanese version. However, some searching on the internet will result in copies of the Japanese original for a moderate cost. Check out the trailer while you peruse the World Wide Web. Next time, we’ll take a look at Mothra vs. Godzilla! Despite mixed reactions due to some of its’ content, Gojira was a proven success in 1954. 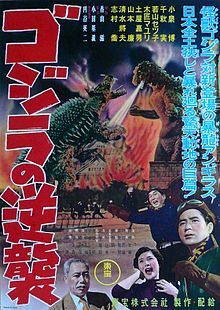 In 1955, Toho opted to stick with the black and white format for a sequel, titled Godzilla Raids Again (or a more accurate translation, Godzilla’s Counterattack). 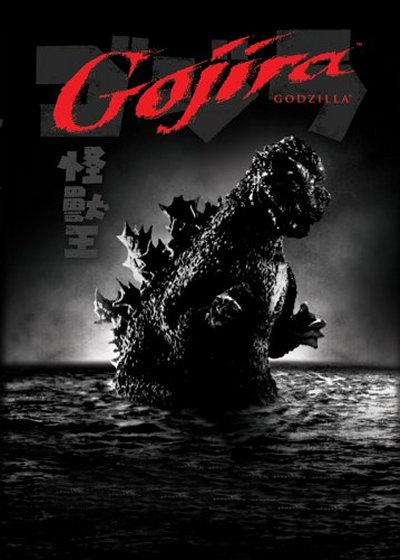 It was a direct sequel to the events in Gojira and was rushed into production to capitalize on the big guy’s popularity. It would establish the scenario of Godzilla vs. the big creature of the flick, a formula that would become standard after this release. The movie begins with two pilots being forced to land on island, where they become witness to a battle between a creature resembling Godzilla and another beast, which we would come to know as Anguirus. After both creatures crash into the ocean, the pilots return with their tale. It is recognized that the original Godzilla died at the end of the first movie, establishing that this creature is essentially another member of the same family. Going forward through the end of the original series in 1975, this is the Godzilla we see and, eventually, cheer for. It’s also stated that Anguirus was brought back to life by a nuclear explosion, continuing on the theme of the evils of nuclear power that Gojira presented, albeit much less grim this go around. Dr. Kyohei Yamane (again played by Takashi Shimura) returns to explain that there is no way to destroy Godzilla. The secret of the oxygen weapon died with its creator Dr. Serizawa. He suggests using flares to scare away Godzilla, which initially works when he arrives on shore in Osaka. A fire lures Godzilla back to shore and this time, Anguirus arrives as well. The first super battle begins with Godzilla using his atomic fire breath to destroy Anguirus. Picking up on the story of the two pilots in the beginning, jets and aerial battles play a big part in eventually defeating Godzilla, burying him in an icy avalanche. Ticket sales were initially high for Godzilla Raids Again despite mixed reviews by critics and fans alike. It sat on the United States distribution shelf until 1957, when Warner Brothers decided to re-cut the film, using only the battle sequences. Their scale would be reduced to that of regular dinosaurs and all scenes of Godzilla breathing fire were to be cut. New suits were made and sent to the US for new sequences for the movie, which was to have been titled The Volcano Monsters. However, after the production company went out of business, the plans were scrapped until 1958, when new producers bought the rights and planned to simply dub the original print. 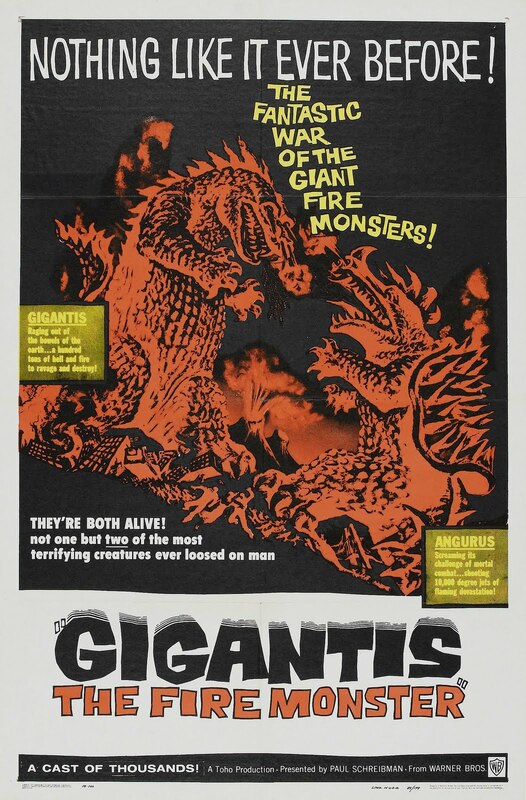 Rather than market the movie as a Godzilla sequel, they decided to rename it Gigantis, The Fire Monster, releasing it in 1959. Godzilla’s roar was changed, footage of dinosaurs was inserted, sub-plots removed and music score replaced. Not surprisingly, fans and critics blasted these decisions. Sadly, this was the only version shown on television and released on home video until 2006, at which time the original was finally available for American audiences. The series was shelved for seven years before being revived in 1962. During that time, Toho brought two new creatures to the big screen, both of whom would eventually be featured in future Godzilla flicks. Rodan, essentially a giant pterodactyl-like creature, was released in 1956 and became a huge hit both in Japan and in the states. Mothra (1961) was also a big hit, which some believe may have played a part in trying out Godzilla again the following year in King Kong vs. Godzilla. On a fun note, George Takei, who would go on to play Mr. Sulu on the classic TV series Star Trek, provides the voice for the character of Tsukioka. George Takei would have a career dubbing voices for Japanese films, including Rodan. Personally, I enjoyed the movie, especially in its’ original form. I also love the glorious black and white presentation. It’s not as dark as Gojira but lacked the comedic elements that occasionally bring some of the other Godzilla movies down. The movie is easily found on DVD. Check out the original Gigantis trailer while you wait for your copy to arrive in the mail. 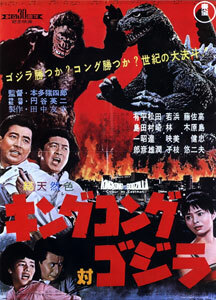 Next time, I’ll check out both the US and original Japanese versions of King Kong vs. Godzilla from 1962. Now that I’ve wrapped up the first series of Godzilla films, it’s time to take a look back at the first 7 spanning 1954 through 1996. I watched all of these last year prior to launching this site but they are more than worthy of discussing here as my goal is to finish up all of the Godzilla movies by October. I’m on track, so let’s get started by going back to 1954. Gojira was best known for many years by the American release title of Godzilla, King of the Monsters! While there has always been some editing done on Godzilla movies for the American audience, it really is accurate to say there are two versions of this first movie. The original Japanese version was directed by Ishiro Honda and he presents what really is the most serious, and perhaps darkest, of all Godzilla movies. Coming less than a decade after the devastation of World War II, some critics felt the filmmakers were exploiting the events of the recent past. Not surprisingly, Gojira had mixed reviews at best, despite becoming one of the top ten movies of 1954 in Japan. Over time, the movie gained more respect and would go on to become the definitive entry in the series. Being filmed in black and white, it presents a very dark and bleak look at Japan. It also sets the tone that Godzilla is a destructive creature that must be stopped. This was years before Godzilla would defend Earth against space creatures or do little jigs after beating the bad guys. The movie is full of stark images, such as victims suffering from radiation burns. Here, more than any other movie that would follow in the series, we see the destructive power of Godzilla. We see the damage of the cities and the anguish on the victim’s faces. Honda tapped into his own memories of the atomic bombs in World War II, ultimately playing a key role in setting this movie apart from all others that would follow. Godzilla is presented early on as a sea creature of massive size and power. Our story follows Dr. Kyohei Yamane (Takashi Shimura) and a team investigating an island where Godzilla has been spotted. After a confrontation with the islanders, Yamane concludes Godzilla was unleashed by a nuclear explosion. After attempts at destroying him fail, Yamane is asked to discover a way to destroy Godzilla, yet he wishes to keep him alive and study him. Another storyline follows his daughter, Emiko (Momoko Kochi), and a bit of a love triangle involving her fiancée Daisuke Serizawa (Akihiko Hirata) and Hideto Ogata (Akira Takarada). Daisuke is working on a secret experiment that dissolves flesh, something that will come into play later on in the movie. Godzilla returns and is never more destructive than he is here. 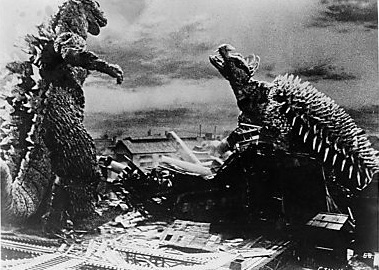 The black and white film really enhances the devastation as Godzilla rampages through Tokyo. Never again would we really see how much damage Godzilla really does. Ultimately, Daisuke’s experiment is used to destroy Godzilla. Because his device is clearly a weapon of mass destruction, he sacrifices himself in the end. Hardly an upbeat ending as the fear is that this is just the beginning and that more creatures will appear. If they only knew what the following decades would bring. 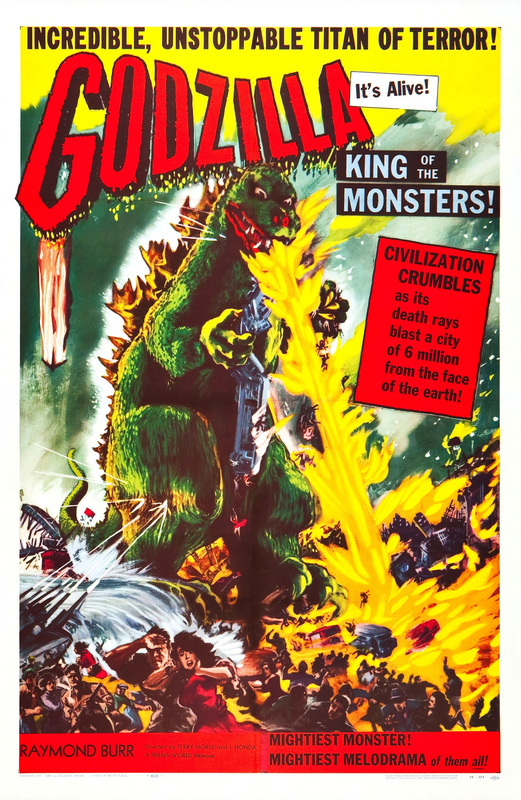 Outside of this version being played in limited theaters in the United States in the 50s and 60s, the version all of us grew up with was actually called Godzilla, King of the Monsters! Many scenes were cut in favor of new scenes starring Raymond Burr, who also provided narration, eliminating the need for a lot of dubbing. In 1956, this re-edited version was released to great success. It laid the groundwork for the Godzilla films that would follow but American audiences had no idea how intense the original version really was. After a limited release in 2004, which received universal positive reactions, it was finally released on DVD in 2006, on Blu-ray in 2009 and, finally, as part of the Criterion Collection in 2012. Whichever release you go for, I highly recommend this classic and strongly suggest you watch both versions as they really are two different “views” of the same story. Next time, we check out 1955s Godzilla Raids Again, another black and white flick which brings a new Godzilla to the big screen. 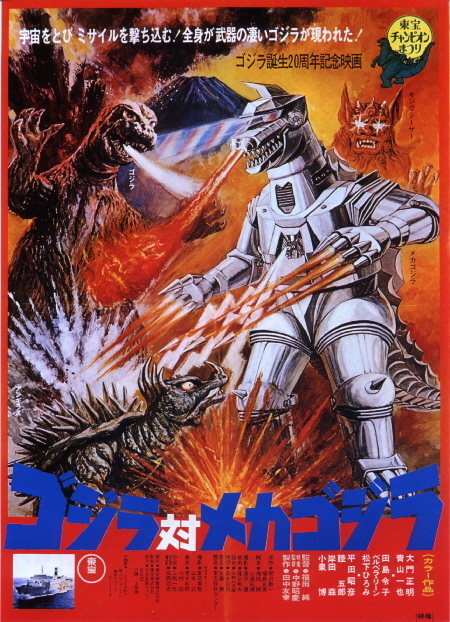 After the enjoyable and successful Godzilla vs. Mechagodzilla in 1974, the 15th entry in the Godzilla series followed one year later with Terror of Mechagodzilla (1975). In Japan, it was known as Counterattack of Mechagodzilla and, upon its’ brief release in the United States in 1978, it was known as The Terror of Godzilla. Despite the fact that director Ishiro Honda returned to the series after a six-year absence, it would be the least successful entry in the original series of films. 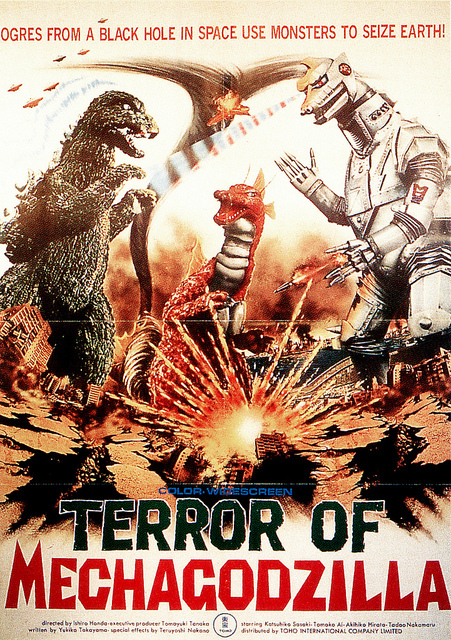 Terror of Mechagodzilla is a direct sequel to the previous year’s Mechagodzilla flick. Interpol is in search of the remains of the original Mechagodzilla. A submarine, the Akatsuki, wants information on the aliens from the black hole. However, they are soon attacked by a giant underwater dinosaur named Titanosaurus. Marine biologist Akira Ichinose (Katsuhiko Sasaki) traces Titanosaurus back to a mad scientist named Dr. Mafune (Akihiko Hirata) and his daughter Katsura (Tomoko Ai). The aliens are searching for Dr. Mifune to have him help them improve on the new Mechagodzilla. Unbeknownst to Akira, Katsura is actually a cyborg and the aliens intend on blackmailing Dr. Mafune using her safety as leverage. To ensure their plan works this time, the aliens put the controls for Mechagodzilla into Katsura. As Titanosaurus and Mechagodzilla attack the cities, Godzilla arrives to protect the humans. Up to this point, the plot really seemed to drag. Godzilla is virtually unseen for the first hour until the final battle begins. Mechagodzilla still looks as cool as he did in the first film and Titanosaurus has a cool effect on his tail that helps him generate hurricane winds. However, beyond that, Titanosaurus doesn’t have much else going for it. Essentially, it takes advantage of whenever Godzilla is down for the count in the 2-on-1 showdown. At one point, Godzilla is buried but, we all know he’s alive and well. The humans build a device to block Mifune’s control of Titanosaurus, allowing Godzilla to burst out of his grave and go at Mechagodzilla for the final battle. Godzilla tears off Mechagodzilla’s head as did the last time only to reveal the brain tissue that Mifune wanted to make this Mechagodzilla better. Meanwhile, Interpol finds the aliens (who oddly don’t turn into simians upon death like they did last time), Dr. Mifune is killed in a fire fight and Katsura, after revealing herself as a cyborg to Akira, kills herself to ensure Mechagodzilla self-destructs. The alien leader escapes in one of three flying saucers, of which Godzilla quickly dispatches. In the end, Godzilla reigns supreme, with his final act kicking Titanosaurus into the ocean. Godzilla goes off into the proverbial sunset for what would turn into a 9-year slumber. Ultimately, Terror of Mechagodzilla was a little disappointing. The storyline didn’t keep me engaged and Godzilla’s arrival seemed awful late. However, once he got on the scene, the last 20 minutes or so turns out to be a lot of fun and a good sendoff to the original series. But the movie was a box office failure in Japan. As usual, there were various titles and some editing for the US audience. The most noticeable change was a five-minute intro featuring the mini-history of Godzilla and quite a few flashbacks. Even though it served no real purpose, it at least gave viewers five minutes of Godzilla footage before they’d have to wait almost an hour for him to get back on screen. The movie is readily available on DVD, generally for less than $10. And yes, the original US poster of The Terror of Godzilla, pictured here, incorrectly showed King Caesar back in the this film. After diminishing returns, Toho decided to end the series of films and give it a much needed rest. They never intended to end it altogether though and in 1984, production would begin on Godzilla’s return for his 30th anniversary with The Return of Godzilla or, as it was known in the United States, Godzilla 1985. 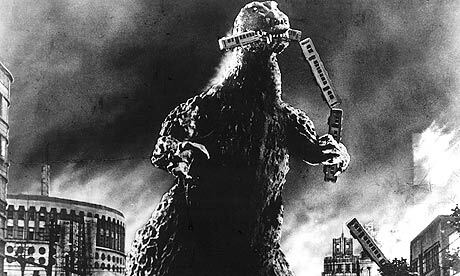 But, before we leap forward to the 1980s, courtesy of a request from faithful reader Stephen D. Sullivan, I’ll be going back to review the first seven Godzilla movies, starting with Gojira aka Godzilla, King of the Monsters (1954). After a long absence, it’s time to get back to our loveable monster legend Godzilla with Godzilla vs. Mechagodzilla (1974). After some pretty rough films in the early 70s, the franchise was showing signs of fatigue. It needed a shot in the arm and it got just that with the introduction of a mechanical Godzilla and a new creature called King Caesar. The plot is typical of Godzilla films from this area. You have essentially two storylines that meet somewhere in the middle with the ultimate Godzilla battle taking center stage by the last 30 minutes of the movie. Here, we have an ancient statue in Okinawa being unearthed and tied into prophecies of a great monster rising to destroy the world. The statue is that of King Caesar, guardian of Okinawa. As various signs of impending doom begin to appear, we’re following two groups of individuals that include Professor Miyajima (Akihiko Hirata) and his daughter, various government agents and a mysterious group of aliens with plans of conquest. Their plan revolves around Mechagodzilla, a giant robotic version of Godzilla that resembles the real Godzilla at first thanks to a fake skin. Mechagodzilla plans to kill the revived King Caesar until the real Godzilla shows up. The usual three-way battle follows including a surprisingly bloody sequence between Godzilla and King Caesar where Godzilla attempts to rip off Caesar’s jaw. In the end, Godzilla and King Caesar join forces to defeat Mechagodzilla and stop the aliens from conquering Earth. This was a lot of fun as it was a change of pace from some of the bad films of the early 70s. Not surprisingly, many consider it the best of the 70s Godzilla movies. It has a fairly cohesive plot, good action sequences and a great soundtrack during the battles. The original script went through many rewrites and included, at various times, Mothra and King Barugan, amongst others. In the end, we were dealt the new King Caesar and a minor appearance of Anguirus. King Caesar’s design is definitely a product of the mid-70s but accurate when considering it’s supposed to be from Japanese mythology. However, it’s not my favorite kaiju design though. The movie was only a moderate success in Japan but an improvement over previous films. It wasn’t released in the United States until three years later. By that time, The Six Million Dollar Man and The Bionic Woman were big hits on American television. 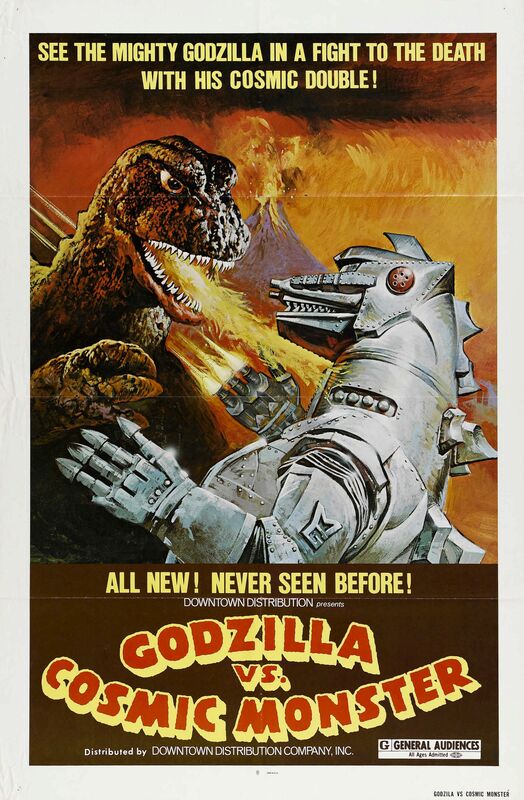 So, Cinema Shares International, who had the distribution rights, retitled the movie Godzilla vs. the Bionic Monster, in an obvious attempt to capitalize on the Bionic mania. However, one week into release, Universal Studios filed a lawsuit against Cinema Shares International, claiming copyright infringement on their two television shows. The movie was retitled Godzilla vs. The Cosmic Monster. Whatever the title, I really enjoyed this entry. It had been many years since I watched it and I was pleasantly surprised how fresh it seems when compared to some of the other entries of the 70s. The movie was released on DVD but is now out-of-print. Copies on Amazon are running about $55, so you might want to check around on eBay or local used DVD shops for something cheaper. Also, be careful you are getting the 1974 version as this was redone twice, in 1993 and again in 2002. Meanwhile, check out a trailer as you hunt for a copy. 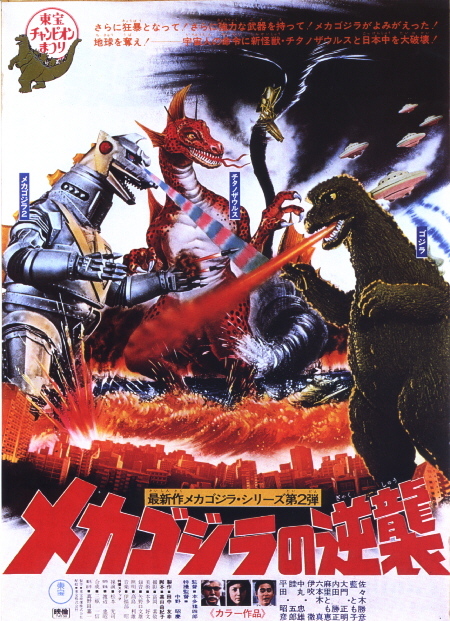 Next time, Godzilla is back in the final entry of the original series, Terror of Mechagodzilla (1975). Check out the Monster Kid Radio podcast! Derek M. Koch is going back to his roots with his new podcast, Monster Kid Radio. Derek is best known for the years he dedicated to the Mail Order Zombie podcast. He also currently co-hosts 1951 Down Place with Scott and Casey, where they review a Hammer Film every month. Not to mention the numerous appearances he’s made on other shows, such as the B-Movie Cast and Dread Media. Now, he’s bringing us another great podcast to enjoy weekly. As the tagline says, Monster Kid Radio is “where Karloff is still king, Lugosi’s still alive and John Agar still rules”. That should explain it all! No, the show isn’t affiliated with this blog but consider us twin sons of different mothers. 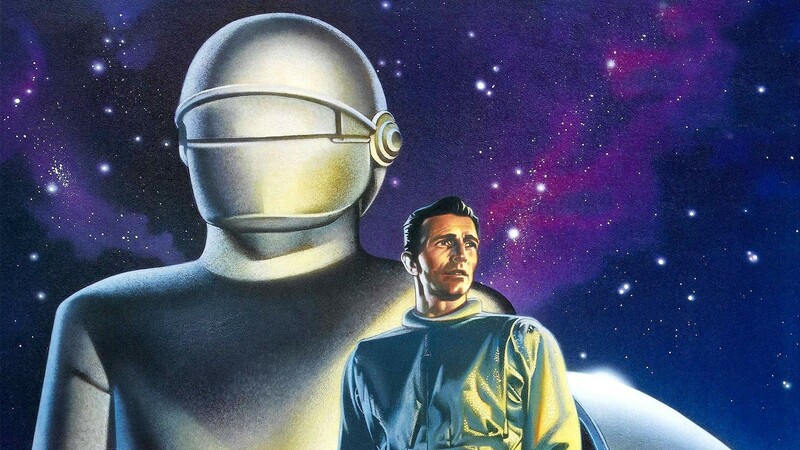 Yours truly is a guest on this week’s episode 7 and the upcoming episode 8 where Derek and I discuss the 1951 classic The Day The Earth Stood Still. I also covered that amazing flick on a previous post. So go check out Derek’s new show! I’m loving it and sure you will too! After watching six theatrical Superman movies with three different lead actors spanning more than half a century the Krypton Kountdown is over. 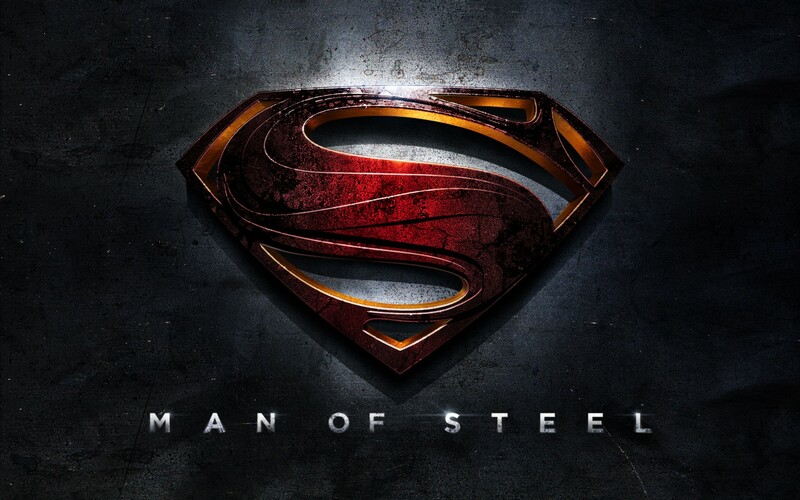 Man of Steel has finally opened to a box office record for the month of June: $125.1 million in just four days. Yes, apparently it’s cool to be Superman again. I’ll avoid all spoilers in this review since I’m sure many people are waiting for the crowds to die down. However, I’ll be offering up my comments as usual and know that Superman was really one of my first two superheroes. Growing up in the 70s, we didn’t have comic book stores yet. Well, at least not in the small town I grew up in. My comic book purchases came from whatever the spinning racks offered or what waited for me in those wonderful 3-in-1 grab bags. I can’t remember which came first but Batman and Superman comics were a big part of my early collection, alongside Justice League of America, which routinely featured both. Over the years, I’ve seen Superman’s origin evolve. The Man of Steel mini-series back in the 80s bothered some longtime readers as it altered some long-standing aspects of his origin. Then there was the death of Superman in the 90s, which again turned off some but also brought many readers into, or back into, the comic shops. After years of floating in and out of comics, I was finally living in a town with multiple comic book shops. So that storyline got me hooked and made me a weekly visitor to my local shop until last fall. After a year of struggling with the New 52 revamp, I decided I was staying old school, concentrating on older comics while only staying aware of what new stuff was out there. 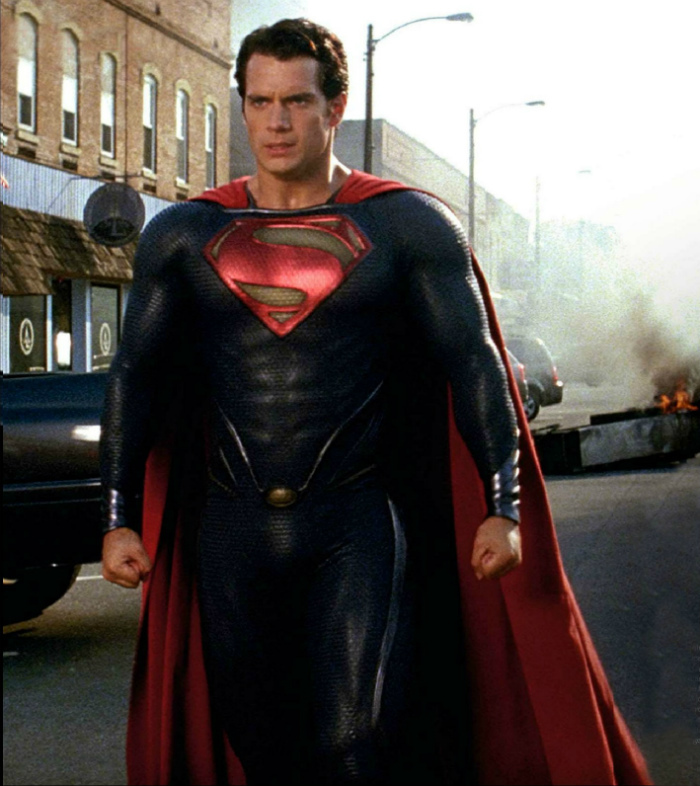 So, I went into Man of Steel fully aware that the costume would be different and the storyline more contemporary. It wasn’t going to be Christopher Reeve’s Superman anymore. With all that background, I went in with level expectations…and I really enjoyed Man of Steel. It’s not perfect but considering how disappointing the last two movies with Christopher Reeve were and how lackluster Superman Returns was, Man of Steel is a huge step in the right direction. Henry Cavill (Immortals) really worked for me as Clark Kent aka Superman. He brought a charm to the role without going into an over smiling Boy Scout performance. That is not who Superman is anymore, be that good or bad. Amy Adams worked for me as Lois Lane and left me wanting to see a little more. She’s far better than Kate Bosworth was in Superman Returns. She’s a Lois for the 21st century. 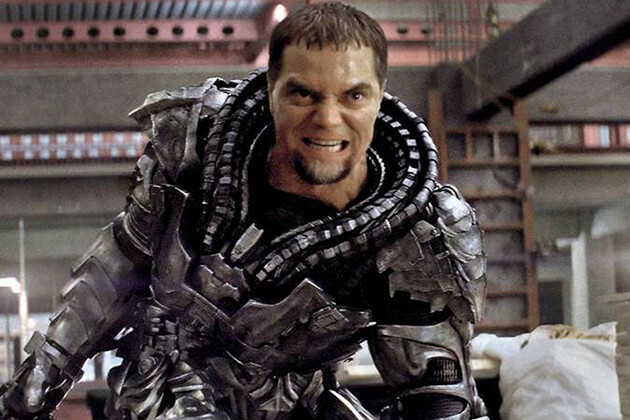 Michael Shannon (Mud, Jonah Hex) was fantastic as General Zod, balancing between a man who wanted the best for Krypton and being a homicidal maniac. Kevin Costner and Diane Lane were great as Jonathan and Martha Kent; stronger characters for a different time. Some people may complain that Perry White is played by Laurence Fishburne since Perry is not African American in the comics. Not an issue with me at all, other than Perry had very little to do. I also thought Russell Crowe did a good job as Jor-El. I don’t think he walked his way through the role at all. He played Jor-El as a Kryptonian, somewhat cold yet warm and compassionate in matters relating to his son. Sorry but I can’t Marlon Brando doing some of the things Crowe brought to the role. The opening scenes on Krypton alter the background a little but not significantly. We get to see more of Krypton, visualizing just how alien this advanced civilization was. As the story progresses, we see young Clark grow into his powers and the struggles he had against his Earth father in deciding when he should use his powers and when not to. I liked how the story fluctuated back and forth between the main story and flashbacks. It wasn’t confusing and told a story that revealed details in relation to how other events were developing on screen. Ultimately, this movie is about the confrontation between Superman and General Zod over the future of Earth. I liked how the authorities were more realistic in how they dealt with and, eventually, accepted Superman. It was realistic in a movie that is clearly based on fantasy. Man of Steel is darker than any version of Superman we’ve seen before. That’s going to turn some people off. However, the old school Superman doesn’t exist anymore in the comic books. If you want to appeal to a younger audience, you have to bring the character to life as he is being interpreted in the comics. The older, more lighthearted Superman stories are still there to discover in your local comic book shop just as the old movies are still there on the DVD shelf. Both versions can co-exist just as the Adam West Batman can co-exist with the Christian Bale Batman. They are two very different portrayals of an iconic character from two different eras, yet both equally enjoyable depending on your mood. If I had any complaint against Man of Steel it is that it could have had about 10-15 minutes shaved off the running time. I have no problem with a movie running over two hours as long as it is needed. The battle sequences here go on a little long. Director Zack Snyder (Watchmen, 300) goes a little frenetic at times but didn’t turn me off from the action. The long battle scenes don’t ruin the movie but a slighter tighter hand at the editing wheel would have made the movie that much better. Christopher Nolan (The Dark Knight Rises) does a solid job as both producer and screen writer. I thoroughly enjoyed Man of Steel. It looks like DC Comics has finally revived this franchise. Now, the question is what comes next. The word seems to be that Warner Brothers wants to fast track a sequel by the end of 2014. I really hope that smarter heads prevail. Rushing a sequel into production is never a good idea. The cast is all locked in for a sequel, so at least we have that. Time will tell what lies next but what we do know is that Man of Steel is a huge hit. With Superman and Batman going strong, will we finally see the Justice League movie many of us have pondered about for years?